The St. Ignatius Mission was built in the early 1890's. 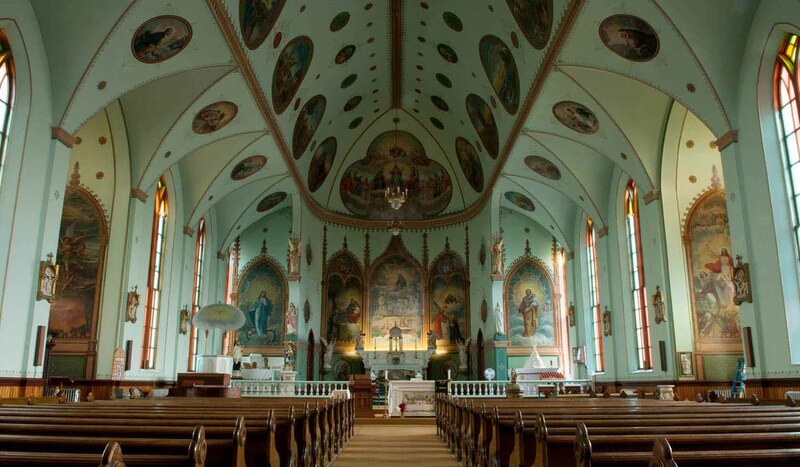 This Catholic Church is unique because its walls and ceilings have 58 original paintings by Brother Joseph Carignano on them. The Mission Mountain Range is a beautiful backdrop of scenery behind the Mission Church. The church is located on the Flathead Indian Reservation. We have two very special paintings of the Salish Lord and Lord's mother (in Native American form) that are located in the back of the Mission. Next to the Mission, we have a museum and gift shop that displays Mission and Indian artifacts and sells religious items. We also have the log home which was the original Sisters' residence when they first arrived. The Mission is open daily for tourists and for those who wish to worship privately from 9:00am - 7:00pm in the summer. 9:00am - 5:00pm in the winter. Sunday Mass is at 9:15am. We are approximately 50 miles north of Missoula, just off Highway 93 in St. Ignatius. St. Ignatius Mission is located approximately 2 blocks off Highway 93. Signs are on the highway, and you can see the Mission from the highway.